Set in two hectares of the British countryside, Laverstoke Mill, Hampshire, is the new home of BOMBAY SAPPHIRE®, the world’s fastest-growing major gin brand by volume and value*. It was the renovated paper mill that provided the inspiration behind the Bombay Sapphire Limited Edition Bottle; an outstanding packaging development that has been awarded the 'Best Bottle in Glass', at the 2014 World Beverage Awards. The elaborate project took packaging designers on a creative journey that lasted over 12 months. The brief was simple: reflect the soul, craftsmanship and essence of the prestigious brand. The result: a stunning limited edition glass bottle that creatively represents the state of the art production facility and visitor centre, located on the River Test. Stretching the boundaries of structural design and decorative printing, the Limited Edition Bottle features illustrations of Laverstoke Mill by award winning British illustrator Si Scott, bringing to life the brand story and maintaining the iconic blue colour, with which the brand is now synonymous. 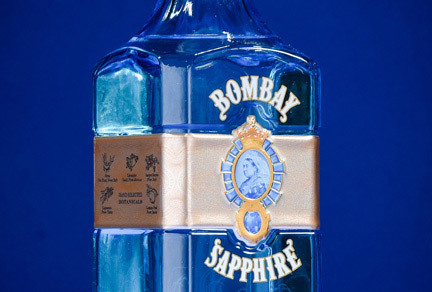 The global marketing team at Bombay Sapphire worked closely with design agency, Webb de Vlam, and packaging manufacturer, Ardagh Group, to produce the sophisticated design, making sure that the bottles would run smoothly on the production, decoration and filling lines. “We successfully executed a number of highly intricate features on the bottle, working in close partnership with the design agency and other packaging suppliers, as well our in-house decoration centre. Furthermore, the continuous print around the facetted corners meant that the ceramic printing process would not provide the required level of detail required. Trials were carried out using alternative decoration techniques and finally, using ceramic water slide transfers, that offer a superior print quality, a solution was found. To achieve the high level of accuracy and avoid any imperfections during the firing process, the transfers were applied by hand, a true crafted finish to a distinctive design. What’s more, the self-adhesive metal band, set into the shaped label recess, features images of the brand’s iconic ten botanicals. A bank note is also detailed; a nod to the narrative behind Laverstoke Mill.